Saturday we took some time to check out Shubie’s First Annual Corks and Forks event, which ran from 11 a.m. to 4 p.m. We got there just before 2 p.m., and the place was packed. 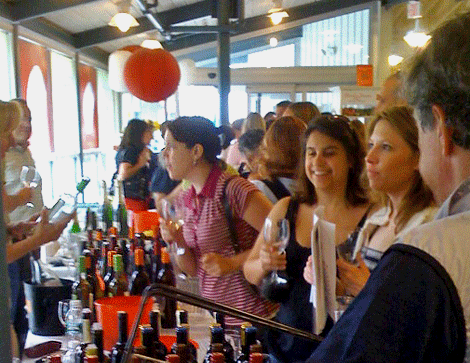 There were seven distributor tables in a relatively small space, with each pouring six to eight wines and so many people milling around it was almost sensory overload. While we are far from being true oenophiles, we love wine and really enjoy learning about and tasting new vintages. Most of the wines were in the $11 to $25 range, and discounts were offered when purchasing six or more bottles. A few of the whites we liked were the Siblings Sauvignon Blanc, which was full of super sassy citrus; the Domain de Huards Cheverny, which was grassy and crisp; and the Zenato Pino Grigio, which was light and summery. Reds we enjoyed included the Carpe Diem Pinot Noir, which was rich and fruity; the Casa Castillio Monastrell, which was savory and a bit peppery; and the Jiminez Landi Tinto, which was strong and direct but quite beguiling. Andrew Crookes, who poured the Jimenez and other Eric Solomon Selections, was by far the most engaging of the reps. Young, chatty, and enthusiastic, he knew his stuff and seemed to genuinely love his job. 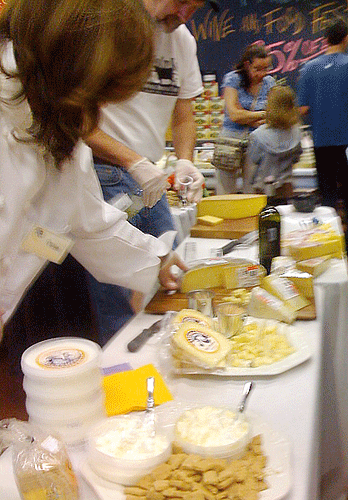 There were also several tables of cheese vendors set up, various chips and dips and sweets set out throughout the store, and servers circulating with appetizer sized tastes from Chef Lynn Aronson’s kitchen. Our favorite cheeses were the Springbrook Farm Tarentaise, a Vermont Alpine cheese similar to a gruyere; the Vermont Butter and Cheese Coupole, another of their “age in your fridge” offerings; and several selections from Jasper Hill Farms. While their Constant Bliss and Bayley Hazen Blue were both excellent, the knock-your-socks off star of the day was the Jasper Hill Farms Winnemere, which is only produced November to April. This was simply the most amazing cheese I have tasted. It is an aromatic raw milk cheese that has had its rind washed in lambic beer and wrapped in a strip of spruce. Everything from the cow’s milk to the wild yeast for the lambic and the spruce bark is harvested from Jasper Hill’s Vermont farmland. The result is complex: a smooth and creamy yet bright tangy flavor with an earthy, almost woody, note that is truly addictive. We brought some home, and it is only through sheer force of will we haven’t inhaled it all and licked the package clean. Yet. Another discovery of note was the Fra’Mani handcrafted salumi which was tasty in the extreme. We tried the salametto, the soppressata, and a rosemary ham, all of which had us snitching extra samples. While the event really only offered bargain prices if you were interested in buying larger quantities, Corks and Forks was a terrific opportunity to widen our taste horizons and take home a few new favorites. Certainly worth checking out the next time Shubie’s hosts it.